It's not nice to play favorites, but I'll admit, I'm biased. I adore all wild birds but none capture my heart quite like that animated imp “Sitta Canadensis” commonly called the Red-breasted Nuthatch. 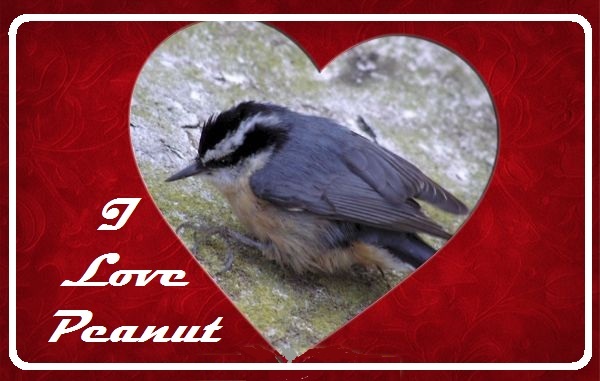 He’s my special little sweetheart, my pal, my “Peanut,” and thus deserving of Reflections’ first “Avian Star of the Week” profile. I first fell in love with this bouncing bundle of energy back during the early spring of ‘09, soon after I’d begun my adventures in birding. Enamored with my new hobby, I decided to move past plain sunflower seeds and experiment with some of the more exotic looking blends that filled the shelves at Fleet Farm. In particular, Kaytee brand’s Nut and Fruit Mix looked delicious. I piled a few bags in my cart and headed home to see if my feathered friends found it equally appetizing. No sooner had I scooped the aromatic mixture of dried cherries, walnuts, raisins, almonds, pecans, pistachios and other delights into the tube than a tiny ball of blue-gray and rust swooped in, just inches from my dumbfounded face. Chattering his approval, he plopped onto the perch and set about digging thru the delicacies. It didn’t take long for this forward lil’ fella to find his favorite. With a peanut in his beak he nodded “thanks” then flew off for the closest conifer. A novice birder, I had no idea what he was, but I sure was impressed with his outgoing personality. Soon after, a consult with my new bible, Stan Tekiela’s Birds of Minnesota, formally introduced me to the species. Since then, we’ve been the best of buddies. The nine months each year he resides at Bon Bon Acres are a delight. I love to watch him hop head first down the conifers and pick thru the mix for that perfect peanut. Red-breasted Nuthatches usually select the heaviest food source available but often sample the suet cakes and munch on sunflower hearts. Sometimes you feel like a nut, sometimes you don’t! Unfortunately, Peanut’s preferred blend is also a favorite of those avian Darth Vaders, a.k.a. Starlings. In their insatiable quest for fruit, these pests would push the nuts to the ground which greatly upset Peanut who will not eat off the earth. After a bit of experimentation, I found the perfect solution. A “cage-type” feeder that protects the tube from larger birds and squirrels worked like a charm and soon became Peanut’s favorite haunt. The Red-breasted Nuthatch is invariably the last of my migrating birds to leave in the spring and the first to return in late summer. This year, Peanut left on June 3rd for his summer nesting niche in the woods of northern Minnesota. In a feathered flourish he returned the last week of August. Trumpeting his arrival, he sought me out, yack-yacked a greeting, then flew from feeder to feeder, even checking out the njyer socks and the nectar stations. Peanut loves it here at Bon Bon Acres. In addition to a well-stocked smorgasboard, he never has to worry about a winter abode. Unless too close to the house, dead trees are never removed but rather left for habitat. Red-breasted Nuthatches are known for taking over abandoned cavities of chickadees and woodpeckers. Even when I can’t see him, I can most always hear his distinctive song sounding out from the treetops. Peanut is one of those birds that just exudes exuberance, fun and friendliness. It’s impossible to be in his presence and not feel of good cheer. In the birding world, good things do come in small packages!